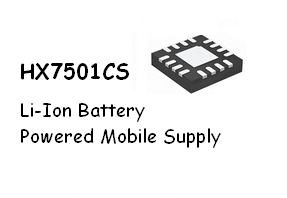 The HX7501 is a complete, cost effective, high- efficient solution for Li-Ion Battery Powered Mobile Supply. VBAT is a complete constant-current/constant voltage linear charger for one cell lithium-ion battery. The charge current of pre-charging and constant�Ccurrent charging is adjustable and it can be programmed to 1A. 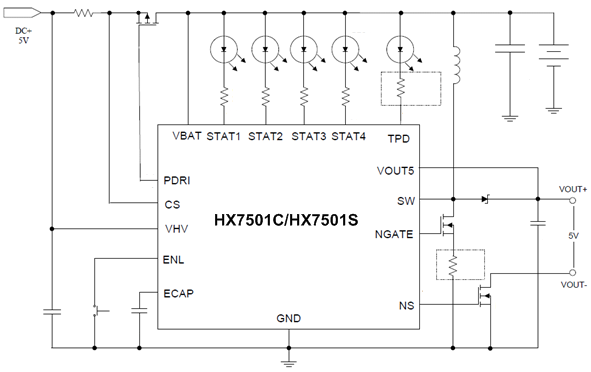 An external sense resistor sets the charge current with high accuracy. VOUT5 (5V) is a step-up DC/DC converter with internal power MOSFETs. It achieves 2A (with 2318 NMOSFET) continuous output current over a wide input supply range with excellent load and line regulation. In addition, the HX7501 can be used as a flashlight. The HX7501C is available in a low profile TSSOP-16L package and The HX7501S is available in a low profile SOP-16 package.